For all readers interested in the basics of computer science. This book teaches you how to read and write mathematical proofs. 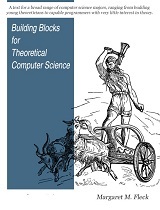 It provides a survey of basic mathematical objects, notation, and techniques which will be useful in later computer science courses. And, finally, it gives a brief introduction to some key topics in theoretical computer science: algorithm analysis and complexity, automata theory, and computability.